Just off the coast of Jakarta, Indonesia, exists a volcano on the small island of Krakatoa. On August 27, 1883, at 10:20 AM, the volcano exploded with a sound heard, literally, around the world. The volcano had been undergoing the cataclysmic stage of its months-long eruption for quite some time, and it finally erupted, making the record for the loudest explosion to be heard, as well as for the loudest sound to be heard on earth. Krakatoa was reputed to be the most dangerous volcano throughout human history. Scientists estimated the explosion’s sound to be around 180 decibels which is enough to rupture the hearing tissue in the human ear. Just to compare, 180dB is about 13x as loud as a jet engine from 100 ft above ground. In the years before the 1883 eruption, seismic activity around the volcano was intense, with some earthquakes felt as far as Australia. At about 13:00 (local time) on 26 August, the volcano went into its paroxysmal phase, and by 14:00 observers could see a black cloud of ash 27 km (17 mi) high. At this point, the eruption was virtually continuous and explosions could be heard every ten minutes or so. Ships within 20 km (11 nmi) of the volcano reported heavy ash fall, with pieces of hot pumice up to 10 cm (3.9 in) in diameter landing on their decks. A small tsunami hit the shores of Java and Sumatra some 40 km (25 mi) away between the time of 18:00 and 19:00 hours. On 27 August four enormous explosions took place. The explosions were so violent that they were heard 3,500 km (2,200 mi) away in Perth, Western Australia and the Indian Ocean island of Rodrigues near Mauritius, 4,800 km (3,000 mi) away, where they were thought to be cannonfire from a nearby ship. Each was accompanied by very large tsunamis, which are believed to have been over 30 meters (100 ft) high in places. A large area of the Sunda Strait and a number of places on the Sumatran coast were affected by pyroclastic flows from the volcano. The combined effects of lava flows, volcanic ashes and tsunamis had disastrous results in the region. 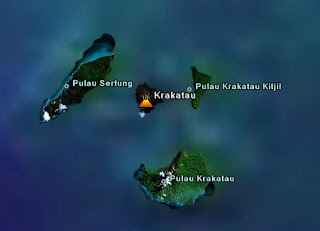 There were no survivors from 3,000 people located at the island of Sebesi, about 13 km (8.1 mi) from Krakatoa. Lava flows killed around 1,000 people at Ketimbang on the coast of Sumatra some 40 km (25 mi) north from Krakatoa. The official death toll recorded by the Dutch authorities was 36,417, although some sources put the estimate at 120,000 or more. Many settlements were destroyed, including Teluk Betung and Ketimbang in Sumatra, and Sirik and Semarang in Java. The areas of Banten on Java and the Lampung on Sumatra were devastated. There are numerous documented reports of groups of human skeletons floating across the Indian Ocean on rafts of volcanic pumice and washing up on the east coast of Africa, up to a year after the eruption. Some land on Java was never repopulated; it reverted to jungle and is now the Ujung Kulon National Park. It was also found that the island of Krakatoa had almost entirely disappeared, except for the southern half of Rakata cone cut off along a vertical cliff, leaving behind a 250-metre (820 ft) deep caldera. Of the northern two-thirds of the island, only a rocky islet named Bootsmansrots (‘Bosun’s Rock’, a fragment of Danan) was left; Poolsche Hoed had disappeared.